So Terry Newell did an article for the Huff Post called “President Obama and Governor Romney: Stop Insulting Me!”regarding the blatant disrespect both candidates seem to have for the American people which I agree with as well. It’s infuriating!But that said…I’m not ready to vote independent. Because I also think as Americans we need to really consider what a Romney presidency vs. Obama Presidency means. Sure, medicare is dead either way sooner or later, it’s unsustainable. But the Affordable Healthcare act was put there to support and eventually replace Medicare. If the Republicans first priority is to eliminate this safety net and then implement their own plan, that’s a problem…especially when doing so is pointless and any new bill will be identical with only minor changes.This is something that needs to happen and we don’t have time to wait for Republicans to spin this off as their idea. Newell also mentions that Obama’s tax hikes won’t fix anything. He may be right. But while taxing those over $250,000 may not make a dent in the deficit; it won’t hurt those paying into it either. You’re not going to have wealthy Americans living in the street or eating SPAM at the new rate. When the Republicans were at each others throats in the primaries, they drew a lot of blood internally and between their constituents over who was greedier, more owned by the corporate machine, and least interested in conservative grass-roots values. What these hikes will do is ease the minds of a working class that feels it’s being used and abused to get votes. Doing it may just keep the masses from dragging 1% of this nation out into the street and cleaning house. It also; to spite Republican claims; won’t make a huge difference in the job market overall doing it (sorry we’re not all working as maids and butlers). Regardless of the state of the union now. Governor Romney does wants us to “believe that drilling for more oil, cutting taxes on everyone, and cutting back regulations will solve the debt problem”. Nobody has told us these “to be named later” adjustments to tax subsidies and loopholes that almost assuredly will reward those contributing to him now. Let that happen with a nation in turmoil and you could literally have riots. And that brings us to the real issue…corporatism and the casting away of the American people. This is one thing the candidates differ on. Romney loves Corporations, Obama tolerates them. But corporations are what’s really killing this country, with copyright, lobbyists, special interest, and reduced competition. “Citizens United” was a mistake and the judges that pushed that through were largely conservative, small companies can’t compete under threat of IP litigation, and they have to copy to compete. Innovation comes when clever people take existing developments and make them better.So we can’t progress as a nation as long as Apple is suing every manufacturer that puts electronics in a square form-factor. More diversity makes more competing companies, more jobs, and things get cheaper to buy. Innovation can’t be the domain of only one or two players. Will the Obama administration stop corporatism, probably not. But under Romney\Ryan it will most assuredly accelerate. when you get right down to it, there really is no other issue of ANY significance. I was driving down 14th street Tuesday when I saw a car parked suspiciously in the road blocking traffic with no cars in front of it. It wasn’t abandoned; the driver was in the car. So I slowed and drove past the vehicle looking at the driver as I went around. He looked OK; he was just staring blankly forward; like he was waiting. So I inched around him slowly and continued on my way while watching the car in my rear view mirror. Something just seemed wrong and I was already nervous about the scene when the car suddenly came to life and his vehicle shot forward; in the telescopic distortion of the rear view mirror he was up on me like a bullet, but a breath later he was literally riding my bumper. It was like he was playing with me. If I pulled forward he’d shoot back behind me. I’d slow down, he’d shoot within inches of my bumper to the left or the right then speed back around. I’d start to act like I was turning; he’d come over as well then straighten out shifting between lanes as I went forward instead. My only guess was that he had gotten mad at me for passing him or something. It really freaked me out; but this continued for a half-mile until I reached within yards of the office and I felt like I could make it into the parking lot. The construction office and the offices in this complex were a bunch of cement reinforced buildings built into a recess below the level of the road. To reach it you have to first pass over a rather large hill meaning that only the very tops of the buildings are visible as you come up on them and the parking lot itself is a good 15 feet below the crest of the hill. The driver behind me had started swerving left and right between lanes and accelerating; people were running out of the way…so I also sped up intending to hide, crested the hill before him, and quickly shot into the parking lot below looking upward and back to see what he would do. He sailed over a four foot retaining wall, into the sidewalk below blowing both front tires, then accelerated across the asphalt directly towards me…I came to my senses, my foot hit the gas, and the wheels just spun on the pavement. I inched forward at what only seemed a snails pace, and as his wheels angled slightly, I was afraid he’d course correct, but after the fall his tires wouldn’t move…the truck slowly moved out of his path and his car sailed past the back bumper of the long bed truck by only inches. As the man’s car hit the curb it sent sparks off the wheels and launched into the air skittering across the small grass patch on the other side. The car drifted in a state where it didn’t appear airborne yet lacked traction embedding itself into the window of the unoccupied office beside me. The driver was silent for quite a while but started screaming like a madman after people ran out to help. He had no idea what was going on. The cops said he was diabetic, his glucose level was only 35, and when he hit that wall they speculated he was going over 50 miles per hour and accelerating. The man survived, but was taken away on a stretcher. By a small miracle, nobody was hurt. Windows Phone is having problems, but it’s not marketing. Windows Phone isn’t selling well, and Microsoft has pretty much spun it as a “marketing problem”. Phone providers aren’t buying into it, consumers aren’t talking about it, business don’t want it on the enterprise. But when you get down to it, Microsoft is all about the marketing. That’s what they do. How can a company like Microsoft that has almost forgotten how to do anything but marketing, have a “marketing problem”? I would suggest this isn’t a marketing problem, it’s a Microsoft problem. First and foremost, history shows consumers that Microsoft can’t make up it’s mind if it wants ad revenue, or sale revenue, and regularly change mode mid-stream once a product becomes popular. Microsoft tries to get both and the XBOX is the best example of this; usually one to get you hooked, then the other once you’re dependent. You can be the most crooked company in the world and people will use you if they know where they stand. With Microsoft consumers don’t. WinPhone could suddenly need media player the way Apple requires iTunes tomorrow and nobody would be suprised. People need “trust” to buy into a cloud application. People trust Google because they know where they stand, and the Android system is community supported. Many even trust Facebook to spite selling personal data because they need it; and at least it’s free. Nobody “trusts” Microsoft, you use Microsoft because you HAVE to. This face alone would breed contempt, but add that Microsoft is already looking for ways to sell cloud data, setting up dependencies between the phone and the MS Live service, etc. Finally, but most importantly. Those that were most loyal to Microsoft got burned bad by the KIN, even if it sucked MS should have supported it…instead they showed how they deal with project they don’t think can fly. Trust me, when you get a phone brand new that becomes obsolete 6 months into a two year contract, you wait to see what happens. Given Microsoft’s track record Win phone could just disappear if it doesn’t sell well. It’s annoying that people are posting this story with “comments off”. So people can;t give feedback. Even that wreaks of MS marketing ploys to generate hype. Something MS is bad about doing instead of trying to fix the PR nightmare the company has become by screwing customers on half built barely stable OS like ME and Vista; Internet Explorer; and the constant stream of security fixes. Can Windows 8 Really Push iPad Sales Under 50% in the Next Two Years? According an article in CNet, the Digi-times thinks it might do just that with Microsoft offering over 32 Windows 8 based tablets by the end of 2012. However, Microsoft has had more than it’s fair share of uphill battles in the tablet and cellphone markets. Windows 8RT won’t have most of the things that have ensured Windows dependance in the past. There will be only limited application compatibility and no domain support. Traditionally Windows exclusive features like “Exchange” and “File and Printer Sharing” aren’t so exclusive any more. While the plan may be to beat iPad for price and functionality much as the Kindles and Nooks have, cannibalizing Apple sales. I’m not sure the Metro UI is going to do that. Plus, if cost was the only issue Playbooks and HP tablets would have done better. One big issue will be whether Microsoft can find one model that works and stick with it. Google has always been pretty honest about how it uses data and Apple has no real interest in advertising revenue. Microsoft is going to have an uphill battle gaining that kind of trust with a history of inconsistency and experimentation. There will always be the question, does free now mean free later, will this device get pulled and abandoned like the KIN did and all support taken away, and will Microsoft turn this device into a giant ad machine that sells my data to the highest bidder once sales improve. Don’t get me wrong, people don’t mind selling personal data for service; but they want to know how and what they’re selling, they need it not to change, and consumers memories are longer than they used to be. Microsoft will not be able to suddenly charge cash for a service if they’re already paying with their personal information nor will they have much luck with tiered services and flavors of operating systems. Google has this balance down to an art, they offer everything for everyone and the ads are payment. Apple chooses to stay out of it all together, and people pay for that ad free experience…but Microsoft in the past has taken our money and our data and even forced ads on various services…they’re in the middle somewhere. As demand\sales increase this type of marketing will give consumers little security in return that a cloud based experience will be comparable to the local one. Do you have trouble finding the right words? Do you feel like you were passed over for a project you were better qualified to head? Do people think your angry and temperamental? Left brained people can come across as unemotional, unsympathetic, and lacking conviction; where as right brained people can come across as angry, irrational, and scattered. If you have a personality that is extremely right\left brain dominant, changing the way you relate and interact with others to reflect a more balanced approach will encourage habits that allow you to interact in a healthier way. But it will also mean moving out of your comfort zone and being more tolerant of others in your workplace. Right brained people need to be more expressive, talk everything out, think about everything your going to say, and clearly define each step in everything you do. Right brained people are often labeled “angry” or “irrational” to spite generally being as agreeable as anyone else because of isolated incidents of “project rage”. Part of this comes from the fact that they are poor at explaining their motivations, so when not able to get others to follow them they often resort to doing it themselves then complaining others are lazy or not involved. Good communication skills are a left, not right brained trait. So force others to meet deadlines, work as a team, and consider doing so “part of the big picture”. Share responsibility and share praise with the team. Recognize individual contributions. Right brained people need to respect order and policy, even when it doesn’t comply with their ultimate goal. Right brainers are prone to violating policies in the interest of “getting things done”. Things like making personal calls while on the job, grabbing snacks put out using the honor system without paying, even eating someone else food from a community fridge. Such actions give others the sense you have no respect. Even if you think nobody sees it, they do and it changes how people perceive you. It will be harder to get support if the right brained person appears disrespectful. Treating rules regulating inter-office conduct as purely subjective, relating to the situation, and secondary to getting results is a mistake. It may even result in frequent disciplinary actions. 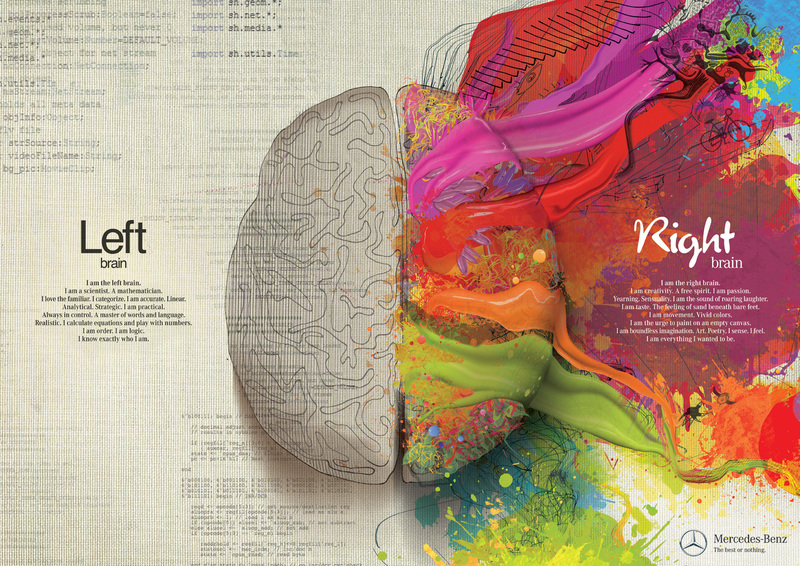 Left brained people need to acknowledge right brained people are necessary. Right brained people have a sense of the big picture, they often take more risks, and they are more tolerant of faults in others. They are passionate about things and that passion is often contagious, they are also more likely to salvage projects others have dismissed as doomed. They deal better with sudden problems and hiccups that come along as they can ignore things which don’t move them towards the ultimate goal they hope to achieve, even if those are things are important at the time. They can also manage budgets better when money is tight, prioritizing what needs to be paid instead of obsessing how unpaid or late paid bills might effect them in the immediate. But, what they can’t always do is communicate that well to others, often they rely on faith and trust. Left brained people need to lighten up. They have an almost lawful sense of how the world should be. Things that limit lefties in relating to others usually relate to imposing order unnecessarily on the world around them, escalating minor issues into major ones, and generally trying to control every aspect of a situation. They might drive slow in the passing lane to block another driver they feel is violating the law or reporting a coworker for working late who is very productive and essential to a project because they went 5 minutes over 40 hours that week or signed in 5 minutes late. They lack empathy for people who “put themselves in a bad position” due to their own poor choices. “They are sensitive to flaws of self and others almost to the point of not being able to accept a person because of their flaws. They tend to not see the whole person but the flaw(s). The world is linear to them. Left brained people focus on what they can resolve most efficiently and neglect moving forward until every minor issue in the immediate is fully resolved. Compensating for left brain extremes is largely about letting things go. Left and Right brained people need to make lists. When little things aren’t prioritized any differently than the big ones it becomes a problem for the right brained person. While numbered and dated lists help left brained people focus on issues moving towards a final goal. When written, lists made with due dates appeal to the mathematical and analytical nature of the left brained person and also allow the right brained person to conceptualize how they will ultimately get to a goal. Practice self-actualization and be overly empathetic. The important thing is not only to recognize traits that fit your own personality. But assume it’s a bigger problem for others than you think it is. Second look for this same brain dominance in others. Recognize the limitations of others; but also that to an opposing personality, your own views may seem equally irrational and misguided. Properly focused, right brained people can use the predictability of left brained people to work out kinks in smaller projects they feel are important to resolve, but not in line with the big picture. Left brained people similarly can put aside their compulsions to enforce minor policy on others and still act as a moral and procedural compass for the group. With a better focus on the big picture relying on the right brained coworker to give 100% to accomplishing the teams ultimate goals will be an asset. It frees the left brained employee to break these processes down into better articulated steps as to why particular tasks or policies are important. What can really drive a media mogul mad? Show him why he’s obsolete. If Lamar Smith is the arm of SOPA, Rupert Murdock has become it’s face. While most media companies support SOPA. 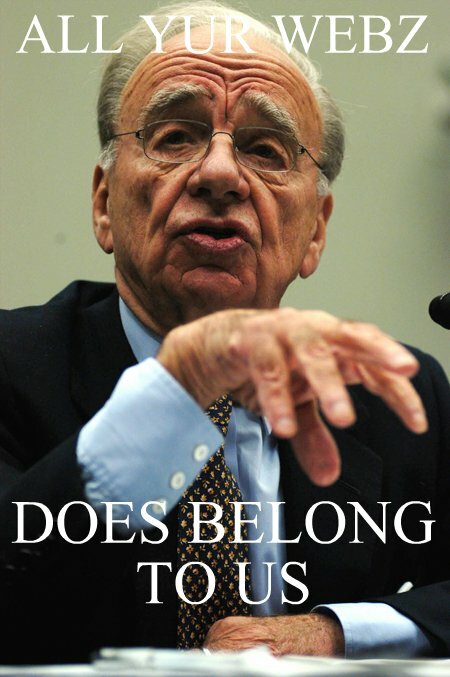 Rupert Murdock began a torrent of rage induced rants yesterday that bordered on lunacy. A tirade following the obvious success of the blackout and protests online that did more to show his irrational and paranoid hostility twords the Internet as a whole then they did to make any valid arguments towards protecting the IP of either the man or the company who themselves were charged with shamelessly wire tapping celebrities, military personnel, and criminally invading the privacy of both British and American citizens just a few short weeks ago . According to Forbes writer Jeff Bercovici and others. The tipping point for Rupert Murdock wasn’t the blackout but more likely the consumer electronics show last week where Google demonstrated browser enabled TV’s that could display content from specific controlled websites like Roku, or freely from the web like a computer. Rupert Murdock made a good show about proclaiming how both legitimate and possibly not so legitimate movies could be viewed, but I’m not so sure that’s all of it. While, I have no doubt IP theft is a concern; the ease of distribution and what it meant for smaller artists wishing to escape the yolk of “Newscorp” like companies of the world is the real issue. What technology like the Google TV and other browser based devices represent to dinosaurs like him is quite frankly extinction.Something I imagine left him tweeting in fear. When made for web TV shows like “The Guild” can become equally popular to a syndicated series like “How I Met Your Mother”, when “Dr. Horrible’s sing-A-Long-Blog” gets a place in history next to “the Rocky Horror Picture Show” or “Pulp Fiction”…the days where all movies and TV are vetted through the approval processes of a single person or group is short as soon as computers and devices are no longer distinguishable from eachother. No more people saying you have to be conservative to do news on Fox, you have to be Jewish to make it in comedy, or any other stereo type the industry has fostered; and you don’t need Rupert Murdock. You just do it. I’m sure the protests contributed too. Not because they showed a public bent on piracy but because they showed that all the advertising power of the Newscorp machine couldn’t out inform or manipulate the public when linked by social media and supported by the Internet. It’s what the Internet has done to books, music, and other media and can do to Movies as well that they fear. In reality, blocking bills like SOPA that reinforce corporate control of media may actually help artists make it on their own and help established artists move into different industries, like when Wil Wheaton started writing books and posting them on Amazon. Maybe once if some untalented hack who owned the means of distribution didn’t sell your artistic expression for you it meant being banned from producing it or being forced to stop making it entirely. But the Internet makes it easy for anyone to distribute content. Those that create do so because they enjoy it, they do it for a living because it’s what they love, and if Google, Amazon, and Twitter can also get their ideas out there then who needs the Murdock machine? …Nobody. What I believe caused Rupert Murdock’s tirade was not concerns over copyright, but how the Internet has empowered us and is leaving his own company impotent and how portable devices and TV will now continue to do so…when the flow of data is such that everyone can be a novice producer, artist, inventor, or musician. Who needs them to sell us cliche movie plots that only advance their own hidden agendas? How can Rupert Murdock and others like him continue to tell us what to think? They can’t…And when we all understand that no reasonable bill that preserves the Internet will ever appease the MPAA or any other group, then we can stop appeasing them at all. Ignore copyright all together and maybe all this non-sense about IP and copyright can finally go away; and with it the mind control these groups have had over the American population since the 1950’s. While movie industry lobbyists and the MPAA like to throw around big numbers, their own inflated records of loss by percent are only slightly higher than that of Walmart or any other retailer. So how far does SOPA go to protect a .03 cent music download or $1 rental. What if all retailers could pass legislation similar to SOPA-PIPA over similarly priced goods? Well, as soon as Hershey’s suspected Walmart customers were shoplifting candy bars they could not only begin the process of getting an order to try and shut the Walmart location down, demand video footage, etc. to find the specific offenders; but in the meantime map makers would be required change maps to hide it so nobody could buy anything else from that location while waiting for trial. The road to the store would be blocked off so that it’s difficult to physically get there or anywhere near there. Phone books would be required to un-list the store’s phone number and address. Credit card companies would have to cease providing services to the store. The company would not be allowed to appeal these processes effectively and local newspapers would no longer be allowed to place ads for the location or it’s parent company nor advocate for them. Any person or organization who didn’t do this would also be subject to severe penalties. This is what SOPA and PIPA would impose in the online world. A system of justice without due process or any method of checks and balances in which punishments severely outweigh the magnitude of the crime and individuals are guilty until proven innocent.